In August 2008, ARCHAEOLOGY’s managing editor Eti Bonn-Muller toured the excavations and nearby Confederate cemetery with Bush, recording some rough footage of the site. Bear with us through the chirping of the cicadas, occasional low-flying small plane, and bumps along the wooded terrain on a sweltering hot afternoon, and experience Johnson’s Island just like the archaeologists do. Begin your tour of Johnson’s Island at the Confederate cemetery and learn the poignant tales told by the tombstones. Current excavations at Johnson’s Island are focused on Block 6, the hospital, and its latrines. plot to free the prisoners was foiled in September 1864. 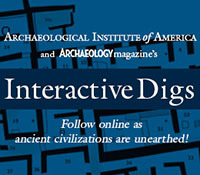 These videos are also available at www.youtube.com/archaeologytv.